Aki was a surface vanir captured by agents of the Halme kingdom of Nagyescsed, imprisoned for later use by the King and Queen in a blood sacrifice. Though she was freed from captivity during a raid led by Ariel and reinforced by a contingent of Highland raiders, she was ultimately slain by a Halme patrol after being separated from her fellow escapees. Aki was a female vanir with hazel eyes and short brown hair. Owing to the mistreatment and malnourishment of captivity, her build was unhealthily thin. Though the experience was taking a severe toll on her, she was able to find some comfort in the presence of her lover, Mazo. Aki's remains are found trampled into the mud. Aki first appeared as Ariel broke into the dungeons of Nagyescsed, huddled alongside her mate. Though Ariel had arrived to rescue Faen, she allowed the other prisoners to accompany them during the escape. After Ariel's group was reinforced by Key'sal and her squad of Highland Raiders, the seasoned squad leader affirmed the decision to allow the captured fae to accompany them back to the underworld. However, many of the prisoners elected to instead travel instead with Chirinide, who sought the homeland of Freyja, a vanir city the young girl claimed had never been overrun. The next morning, following their escape, the two groups separated to follow their own paths. The decision to part ways with the well-armed Highland Raiders would ultimately prove disastrous. Following the escapees' trail with the aid of hounds, a pursuing group of halme soldiers were able to track down the group in the Nagyescsed mountain range, northwest of Nidavellir. As the others sought to hide in a nearby hut, Aki was separated and attempted to continue fleeing alone into the fields. Though a pair of halme soldiers and their hound came across the hut the others hid in, they were called away before they could investigate as the rest of the patrol continued to track Aki. In this way she, perhaps unintentionally, saved the lives of the others. Sadly, fate was not so kind to Aki, as she was hunted down and slain by her pursuers. The rest of the group stumbled across her remains the next morning, able to do little but mourn the loss of their fellow. 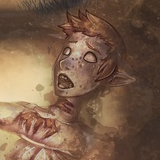 Mazo in particular was stricken by the loss of his mate, sobbing into the mud next to the body of his beloved. "To have survived so much only to die now." - Myou, bitterly reflecting on Aki's death at the hands of a Halme patrol. This page was last modified on 25 October 2018, at 14:21.